(1) Disc brakes will now be allowed in cyclo-cross competition. (2) The legal tire width in competition has also been changed. Width shall not exceed 33 mm, whereas before the maximum width was 35 mm. 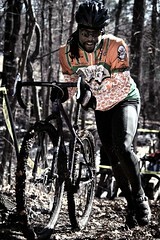 (3) Continental Cyclocross Championships have been established. (5) The height of barriers is now a maximum of 40 cm instead of a defined height of 40 cm. 6) Man-made sand pits are now allowed and the dimensions for them have been established. (7) The distance between planks has been changed to a range of 4 to 6 meters between. (8) Commissaires may now authorize feeding if the temperature is above 20 degrees C. This feeding takes place in the pit lane, but not during the first two or the last two laps. 9) The commissaires may now invoke the “80% rule” and remove a rider who is behind the leader by 80% of the leader’s lap time. Thus, riders can be pulled before they are lapped. I don’t know. The disc brakes may be legal, but the tires in that photo certainly appear to be wider than 34c–more like 1.9″.